Why do I visit high schools? Posted by Thom on Friday, October 5, 2007 in College Fairs and VU Visiting Your High School. As I was thinking about this blog and all of the details I have included about where I go and what I do, it never occurred to me that maybe the students don’t really get WHY I do these high school visits. In order to benefit the readers of my blog (in addition to the entertainment you are so obviously getting), I want to give helpful hints and insights into the process. And, since we are in the midst of travel season, dissecting the high school visit seems like the perfect place to start with this type of info. So, WHY do I visit high schools? I visit schools to educate students and high school counselors about Vanderbilt, selective admissions, and the college admissions process in general. The purpose is not for me to rack up frequent flyer miles and hotel points (though I do a lot of that); the purpose is to help you in the college admissions process, which can be overwhelming and confusing. So, when a college representative comes to your school, please use us- pick our brains, ask the tough questions. I am totally sincere when I say that I want to help students navigate the admissions process. At one of my visits last week I talked a bit about Vandy, but spent the majority of my time answering questions about admissions in general- we discussed the Common Application (one application accepted by 300 colleges and universities), the FAFSA (Free Application for Federal Student Aid) that students must complete to apply for need-based financial aid, application deadlines, etc. I often hear from students who are concerned because my visit time at their school happens to coincide with a big test or an important class that cannot be missed. They worry that if they don’t attend my visit, then I will feel like they are not interested in Vandy, and maybe that will affect their admissions decision. What?! These students are putting so much pressure on themselves, for no reason! 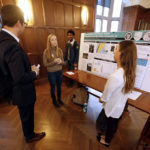 I know that students considering Vanderbilt are enrolled in very advanced classes; and, as a former AP Calculus teacher, I know that teachers are not always supportive of students missing class to meet with a college rep. Please don’t feel like you must attend a college visit at all costs- as explained above, these visits are supposed to be helpful to you. It is perfectly fine to send me an email with your questions that you didn’t get to ask me in person. If you really want to meet me, it may be a good idea to get out of class for 10 minutes to introduce yourself and pick up some brochures before heading back to class. And, if you miss my high school visit entirely, all is not lost! 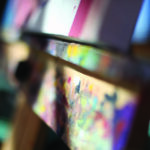 We provide many opportunities for you to meet a Vanderbilt rep in a place close to home. 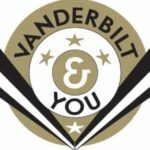 In many territories, my colleagues and I attend college fairs throughout the year on the weekends and in the evenings- come see me standing behind the Vanderbilt table (more on my suggestions on what to do and not do at a college fair in a future blog). Also, as I mentioned in my first blog, we began the season by hosting the Vanderbilt Roadshows in over 75 cities nationwide. What I really want to impress upon you is that it is OK to not see me if I come to your school. No hard feelings, no future penalties, no judgments, and no affect on your admissions decision. Really. 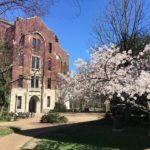 Vanderbilt does not use demonstrated interest in our process, which means that we don’t factor your interest (number of times you call, email, visit, or contact us) into your admissions decision. Similarly, please repay the favor and don’t hold it against me if I don’t make it to your high school. Obviously we cannot visit every high school in our territories, and you would be surprised at the number of limitations that affect our travel schedule, including (but not limited to) PSAT day, Teacher Planning days, early release days, Jewish holidays, fall breaks, the geographic location of your school, and your schools system’s policies on college visits. If your Vanderbilt rep (find out who that is here: http://www.vanderbilt.edu/Admissions/applyCounselor.php ), doesn’t visit your school, feel free to shoot him/her an email if you have questions about VU or our admissions process. 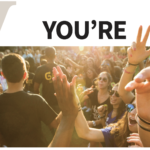 Thanks for subscribing to the Vanderbilt Admissions blog.